A comforter or duvet insert is one in the same. It may be filled with down, feathers, cotton, wool, silk, or synthetic fibers. Down is widely considered to be the lightest and warmest filling available. It offers an ideal combination of self-adjusting warmth, and invites a plush look that is very light in weight. 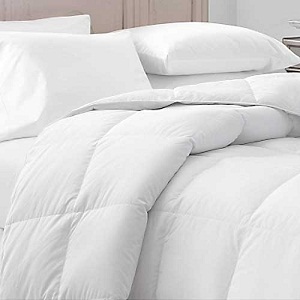 Find the newest bedding fashion and the highest quality bed linens today. Duvet covers and beautiful decorative bed pieces including shams of all sizes. Keep your sheets soft with specially-formulated linen care.